February 2014: Thank you for hosting our extended stay . . . It’s been a real home from home, very comfortable + welcoming – a pleasure to stay. December 2013: We have had a lovely stay, truly relaxing in God’s country! Barry + Elaine couldn’t be more helpful + accommodating if they tried. Cottage is gorgeous + has everything you could ever need. We will be back!! November 2013: A perfect way to enjoy the Allendale experience. Superb hosts in an eco friendly cottage setup. Lovely and warm despite snow, frost and biting winds. The weather has been superb and so has out stay at Swallow’s Rest. Thank you! August 2013: A very enjoyable return visit. Cottage is lovely with all amenities needed for a comfortable long weekend. We look forward to the next visit! April 2013: We have really enjoyed being here. A lovely warm welcome set the tone for a relaxing peaceful break in this beautiful cottage. Cosy and well-equipped – it had everything we could have needed. Have enjoyed the great weather too! March 2013: First class accommodation. The weather was kind in the extreme. Perfect place to wind down. See you in October. October 2012: Despite time of year, warm weather only matched by warmth of welcome from our hosts. Spectacular autumn display in sunshine and then back to enjoy this excellent property. March 2014: We have had a lovely week the cottage is perfect and even the weather couldn’t have been better. We have enjoyed the walks through Allendale and the river. Vindolanda is definitely worth a visit. Thanks to Barry and Elaine for making us feel so welcome we will definitely be back. 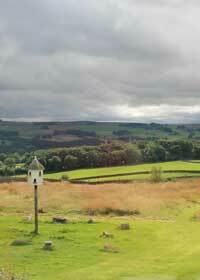 September 2013: Wonderfully appointed cottage in outstanding surroundings, whose green credentials are truely amazing. Thank you so much Elaine & Barry for making us so welcome and comfortable. Barry even supplied spectacles for a forgetful visitor!!! April 2013: Thank you for the fantastic welcome and lovely cottage – one of the best we’ve stayed in! Lovely walks with the dogs. Thanks again. April 2012: Sublime! Dove Cottage and the scenery really has the “wow” factor. We’ve had a really lovely time. The cottage is beyond our expectation and Barry + Elaine are great hosts – Loved it.